As I was throwing away my husband's empty deodorant container, the back label caught my eye. 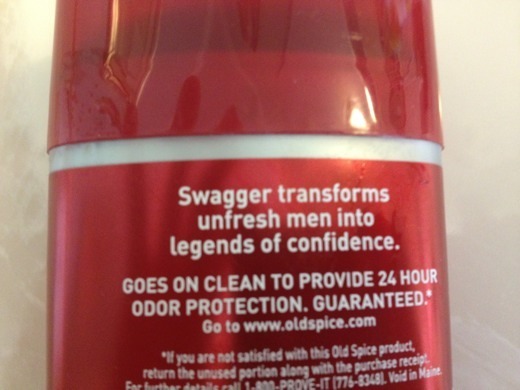 So does this mean with one swipe of the deodorant he gains an unlimited amount of confidence? That men automatically become Tony Robbins when they use this? It is a bit depressing to think that the people who write the verbiage for this product packaging actually get paid. 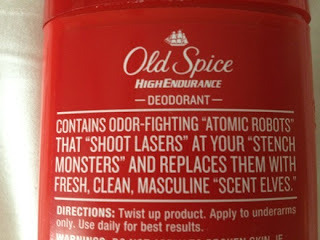 It is apparent that they do not trust men to judge their product on its merits and ability to stave off underarm odor. My husband's comment was "That is awesome!" Mine claims to "please rather than overpower the senses" not turn me into Wonder Woman, although that would be nice! Really? This is what convinces men to buy this product? 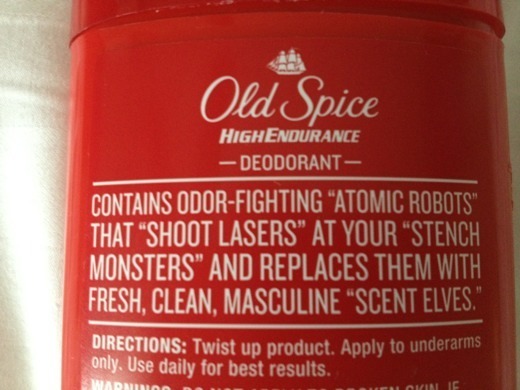 I wonder how many men actually buy their own deodorant? I'm sure the women that purchase these items do not read the packaging. I know I did not. My decision was based on price, not the necessity to massage my husband's ego through his deodorant packaging. I'm not a man, but I felt a bit insulted. Would you buy this product based on the packaging? I never really noticed. Hysterical, lol.